Note: Only four games this week guys. This week on the The New Standard we're going to branch out from our regular programming and take a dive into something completely different. Instead of looking at a single legend deck, we're going to study an archetype. Handbuff Paladin has been a dream since Mean Streets first came out, but it never quite saw its potential. Now, as we're so close to rotation, I thought I'd dive back in one more time. You'll notice this is going to be a theme on my series for the next few weeks, but it's always good to try the old favorites. Not only is a fitting goodbye, but it's also a good lesson on how to find success on the ladder. Young Dragonhawk This deck is predicated on a very simple idea: everything is a threat. It does not matter what you're putting out, you want every body to be something dangerous. 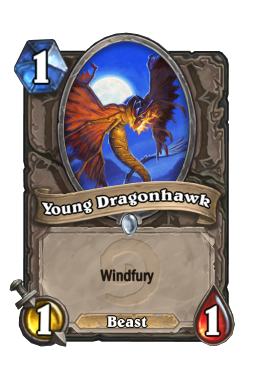 Young Dragonhawk is one of the weakest cards in Hearthstone. Windfury is extremely dangerous, but a 1/1 body is a joke. Not only does it die to every other threat in the game, but it also gets eaten by most hero powers. However, when that 1/1 becomes a 2/2, 3/3, or 4/4, things get much, much more dicey. Know that, and always try to get the beast into areas where your opponent cannot easily kill it. 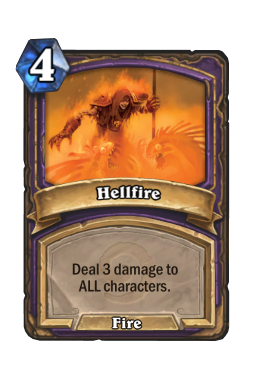 The one drop is very unassuming at first glance, but with a buff or two it easily becomes the scariest card in your list. For that reason, you can also use this as removal bait if you want to take the heat off something else on your board. Another big part of playing Young Dragonhawk is dropping it into situations where your opponent won't have removal. As you have so many thick bodies, your opponent's are going to be scrambling to come up with answers to everything. Sometimes they will have strong minions, sometimes they will have spells or AOE, but eventually they are going to run out of removal. As a buffed Dragonhawk (especially with Dinosize ) will end the game in just a few ticks, you almost always want to drop it after everything else. If you think your opponent has no good answer, you should run it out as soon as you can. However, if you need to bait some spells, you almost always want to do it with your other cards. Of course, you don't want to to bend backwards trying to save a 2/2 Dragonhawk, but a 3/3 or higher is worth the investment. Drygulch Jailor I think this is perhaps the most interesting inclusion into lists I've seen, and it makes quite a bit of sense when you think about it. 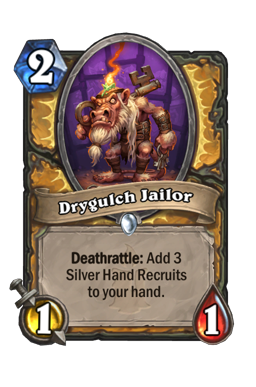 Drygulch Jailor has traditionally seen play in the past because it is four bodies in one card. 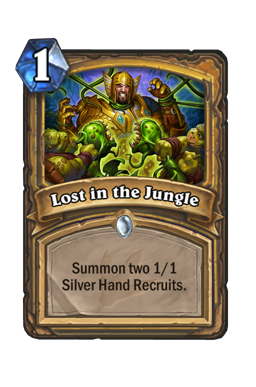 Dude and Aggro Paladin both love the 1/1 because, while it is initially a tempo loss, it comes back around on the following turns to dominate a board. 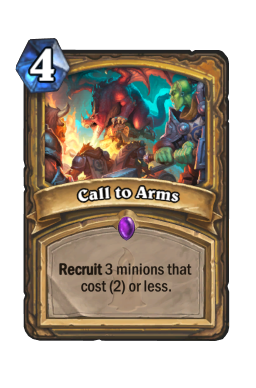 Here, it has a ton of utility for the same reasons, but you have to add onto the fact that the Silver Hand Recruits you get are also going to be bigger than 1/1's. In that way, you are paying a weak investment up front in order to get a gigantic amount of value later on in the game. One of the biggest setbacks of Handbuff is that there are times where you simply don't have anything to buff. Sure, you might hit one card here and there, but that doesn't really mean anything when you're looking to big or go home. Drygulch fixes this by adding three extra points of power to each of your handbuff cards. In addition, by creating big "free" 1/1's, you can also fill out your curve while providing gigantic threats. 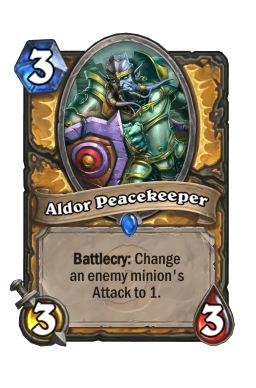 Aldor Peacekeeper Most of the time, Aldor Peacekeeper is a control card. You play the three health minion as a reactive play in order to shut down big threats or pace the board in order to set up removal. However, sometimes, this card is one of the best tempo cards in the game. We all know how strong good trades are in Hearthstone, and that is especially true when piloting a deck that depends on having the board for most of the game. Aldor is fantastic here because it has the ability to freely switch back-and-forth between defensive or offensive depending on what you need. 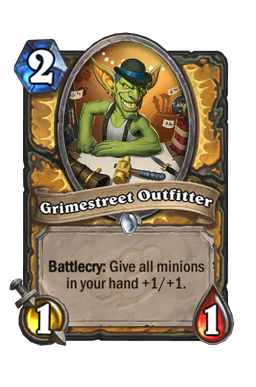 Though, you should know that this card is always going to be much better offensively. People will often drop down big threats to counter yours, and if you can get a good trade while developing a body you will come out on top almost every time. Do not forget that this card also does a great job of dominating a board on its own. A 3/3 against a strong two or three drop is a great way to generate tempo, but once this thing is buffed it does a fantastic job of swinging the middle turns. For example, using a 5/5 Aldor Peacekeeper to shut down your opponent's 5/5 or 4/6 threat instantly puts you in control of the game. Do not be afraid to be aggressive here. Beyond that, there are also going to be strong targets for this in every matchup. 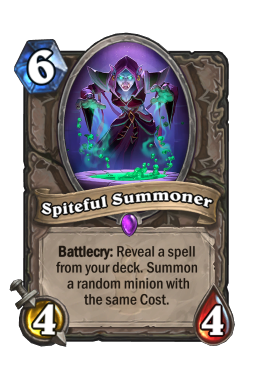 While this card is a great swing play, you also need to be careful about how you use it when your opponent has cards like Savannah Highmane or Spiteful Summoner . Just be aware that Spellbreaker is extremely popular right now. The 4/3's ability instantly shuts off the 1 attack, and you never want to think you've countered lethal only to get crushed on the back end by the four drop. 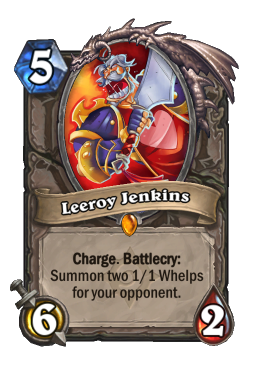 Chillblade Champion It's time to build your own Leeroy Jenkins ! A lot of the cards in this build can be freely switched around depending on the meta and your own personal preferences, but I think you have to run Chillblade Champion . Damage is always going to be the most important thing in Hearthstone, and it is a mistake to run a deck like this without burst. That is because almost all your threats are "slow" in the fact that they need to come down before getting in hits. As such, while you may have a lot of big bodies, certain decks can drain your resources with strong removal or well-timed AOE. If you have no burst, those games are likely losses. With burst, they are in your favor. 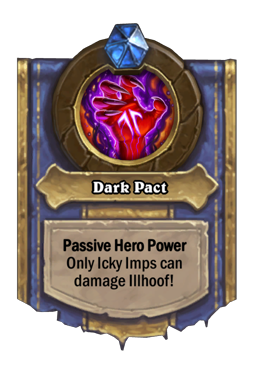 Even with one buff this card is fantastic, but with two or three it is one of the best ways to end a game or make good use of an aggressive board. You almost always want to play to Chillblade Champion if you can. The damage is incredibly important, especially with so many tight window decks running around right now. There are many games where your opponent is only going to give you a small chance to kill them, and you have to be ready to take it. Using Chillblade on curve can be right if you have no other strong plays, but most of the time you want to play your other minions first because their damage needs a turn to get ready. Also, note that this is one of your best defensive tools. There are quite a few aggro running around, and getting into a race is always going to be tricky. Being able to both push damage and heal at the same time is one of the best ways to ice a close game. Dinosize Easily the most interesting inclusion into this deck, Dinosize makes a fantastic finisher. Why? Say it with me now...surprise. I don't care if you're sick of me going over it again, but the element of surprise is so important in card games. That goes double in the high ranks where most of the skill comes from being able to properly anticipate what you have. 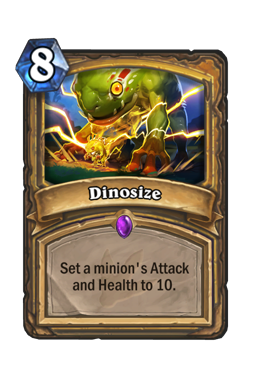 Dinosize is a massive amount of damage out of absolutely nowhere that nobody on ladder is going to play around. You don't have to be fancy with this one or two to jump through a bunch of hoops. You'll have targets, and if a game ever does get to turn eight you should be able to close the door before any tricky finishers come down. 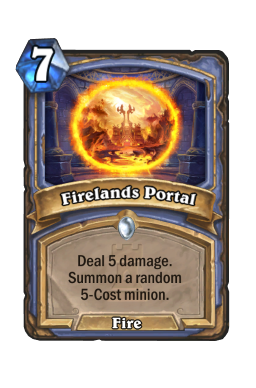 Ten damage is a lot, but getting this in before Voidlord may be even more important. Your goal with this card is to set it up in a way where it doesn't look like you're trying to set it up. That is to say, don't get pushy or telegraph one single Young Dragonhawk . Rather, you want to play your normal cards and get wide. Then, as your opponent focuses on your bigger minions, you turn one of your 1/1's into a massive beater to finish them off. Also, this card doesn't have to be used on a 1/1. Yes, you may want to try to hit a small minion for "full value," but 10 damage is 10 damage no matter how you swing it. Always prioritize windfury minions first with this, and then look for your other options. The four decks I see the most while playing the ladder. Control Warlock Time to get big. As you know from the past few weeks, Warlock's biggest weakness is a string of constant threats. That is exactly your mantra, which leaves you quite favored in this one. While silence is going to be your best friend, you can often force your opponent on the back foot early and then run them over by never letting up on the gas. This is the only matchup where you just need to play as many bodies as you possibly can. 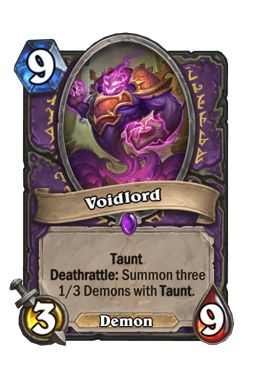 It is true that Warlock has a lot of removal, but it won't take long for you to outclass that. Just a few buffs makes those pesky Hellfire s useless. 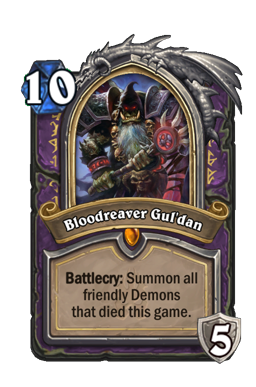 You cannot play around removal because you have to make sure you kill your opponent before Bloodreaver Gul'dan . Of course you don't want to overextend, but don't let up. As soon as you have a weak turn, it will give your opponent the window they need to hit their combo. As always, play to your Spellbreaker . The four drop is in this deck for this matchup, and you should keep it when facing Gul'dan no matter what. 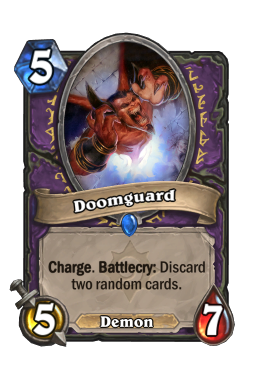 You should be able to beat Warlock down through the first five turns, which is going to force them to lean on their middle turn combo cards to bring them back. When that happens, you shut them down and they lose. 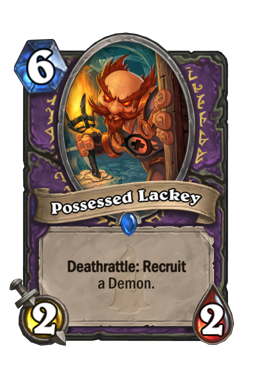 Never hesitate to silence a Possessed Lackey , and always be sure to kill the thing you silence if possible. 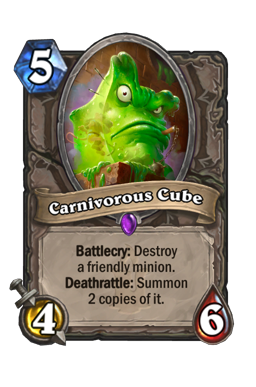 It may seem easy to ignore, but letting something live just allows your opponent to Carnivorous Cube /Dark Pact it the following turn. If you take it down and your opponent has no other combo cards, they're dead. Aggro Paladin When fighting against your faster younger brother, it always helps to trade, trade, and trade some more. Paladin is a great deck that preys on the current meta by being able to go wide. However, they do not do well with taunts. Your goal in this game is to grind your opponent down by putting up more walls than they can handle. It does not matter whether you're up against Dude or Murloc, you have to get as big as you can and then use those large threats to force your opponent to react to you. The only way you can shut out is if you have nothing to do early on. Don't worry about abilities in this one. It may not feel good to use Aldor Peacekeeper on a 2/3 or even a 1/1, but a body is a body. That is going to be worth a lot, especially on the turn before Call to Arms . Turn five is typically going to be the switch here. That is to say, it is the point of the game where you give up on trying to pace the board and start going face. People often get hyper-defensive when playing aggro and make trades that don't make sense. Sure, you can constantly control the board, but without the right taunts you'll never be able to keep up against the swarm. That typically leads you to being chipped down until you succumb to burst. Unless you have an extremely taunt heavy hand, you should avoid that route. Rather, use your giant buffed minions to hit your opponent hard. That will then turn the tables and cause them to be cautious. Once that happens, you'll beat them because of how much stronger your end game threats are. Even one strike at your opponent's face can instantly make them re-think their plan. However, don't be foolish either. If you're under pressure, don't fall into burst range. Rather, play defensively until you can find your heals and taunts. Hunter Good ol' Hunter. This matchup is a lot like the Paladin one where you don't really care what you're dropping down as long as you're doing something to impact the board. 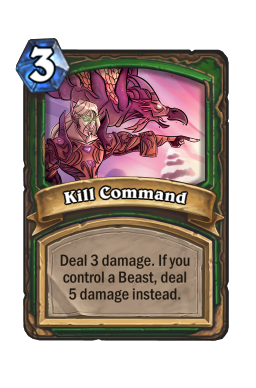 Hunter is the most curve-dependent deck in the game right now. As such, your goal needs to be to stunt that curve. Though you don't have too much early game, you have enough that Hunter will need to trade rather than push for face. On that note, this is a game where you need to heavily rely on both taunts and healing. 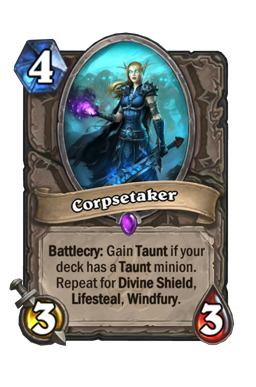 Corpsetaker is easily the best card here, but anything that forces Rexxar away from his hero power is strong. Do everything you can to get your opponent focused on the board. That type of play burns resources, which then makes your follow up turns that much stronger. Secrets are extremely tricky to play around. While you don't want to use a 1/1 to attack into a turn two Wandering Monster , you also don't want to give your opponent free bow ticks if you can avoid it. The general rule is to hold back if you're going to give your opponent a free minion. In addition, things like Explosive Trap and Snake Trap are being run. That means you have to keep all of the Hunter secrets in mind when trying to figure out how to play a turn. The safest bet is to run in with a small divine shield minion if you can. 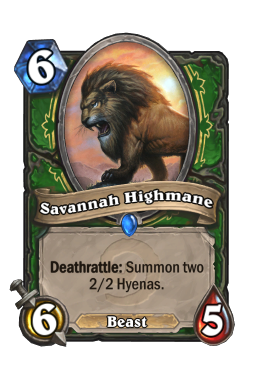 Finally, this is a matchup where you need to save Aldor Peacekeeper and/or Spellbreaker (depending on your board) for Savannah Highmane . The lion is still one of the greatest cards ever made, and you are going to have no chance against it if you aren't prepared. Always keep something on hand throughout the match. 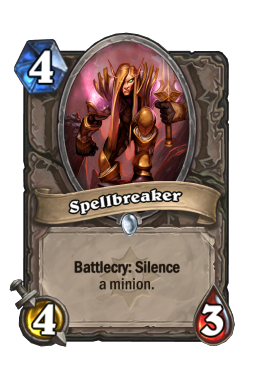 If you have both tech cards, you can typically drop a Spellbreaker on smaller minions. The 4/3 is going to have a lot of utility in this one. Secret Mage Secret Mage is a tough matchup on paper, but one I find to be much easier in practice. That is because, as strong as they are in the early turns, you have a lot ways to play around them. Divine shield minions eat Explosive Runes (at the price of a bit of face damage) and you have a lot of ways to pressure them right off the board. Mage is a great deck, but it doesn't like being out of priority. If you can start pushing large bodies during the early turns you will be able to make your opponent use burn as removal on the board. That is always the goal because every removal spell is less damage on your face. Another important note is to try and buff Chillblade Champion /Corpsetaker as much as you can. Those cards can win the entire game on their own if set up in the right situations. 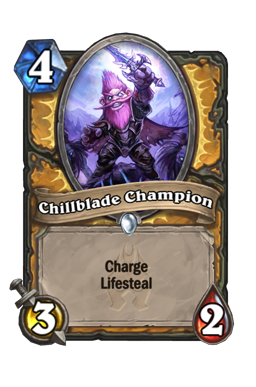 Chillblade is especially strong because it always heals you when it attacks, and then it typically demands immediate attention from your opponent so that it cannot attack again. 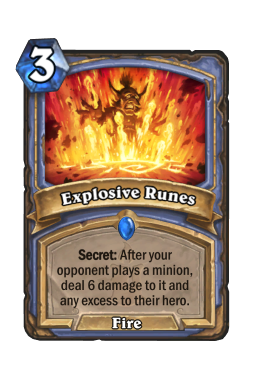 Just don't forget that, as always, once Aluneth comes out you need to push for damage in any way that you possibly can. Never get complacent and never allow your opponent draw cards with no consequences. Aluneth is a dead turn. When they spend six mana to not impact the board, you need to hit them hard. Cuuurve. 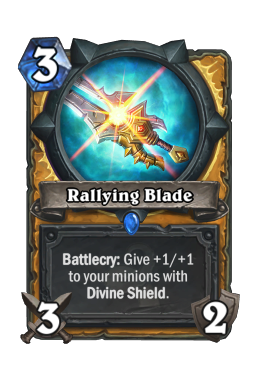 Yes, Handbuff Paladin is a curve-based midrange deck, and that means you have to be able to hit your drops as they come. That makes mulliganing pretty simple. Always keep Righteous Defender, Young Dragonhawk , Drygulch Jailor , and Grimestreet Outfitter . Beyond that, you should look for Rallying Blade and Stonehill Defender on curve or with the coin. Your four drops are also great on curve. Spellbreaker should always be kept against Warlock, and you always want Stonehill against control builds. Aldor Peacekeeper is wonderful against aggro or midrange. Handbuff has always been such a fun concept, and I think it's in a pretty good place right now. Tempo decks (which this most definitely is) have not quite come back in the way I thought, but there is still definitely a place in the meta for them. This build preys on many popular decks right now because, unlike previous builds, you have ways to get back into games with big taunts or wide threats. It is not easy to play something that just dies if it curves out, and this solves that problem in an elegant way. Until next time, may you always Dinosize your Dragonhawks.